This is Pulse by Danguafer/Silexars(2010) from the ShaderToy collection, changed to work with multitouch. 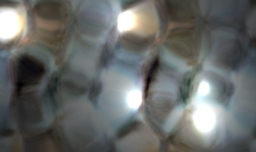 Coincidentally I've been completing the porting of many of the Shader Toy shader collection over to QC GLSL . I'm still figuring out GLSL but you're really taking it into new areas by incorporating Multitouch interfaces. I find it quite amazing how often one can alter only the fragment shader in the default GLSL Shader to get truly amazing results. I think, from your slide show posts on Facebook that you've gotten way more reliably ported over than I have . [Just twigged as I wrote that you have ported 38ish - that's a new number on me BTW :-)]. Getting a truly original shader hosted at Shader Toy is becoming an ambition. Some amazing work posted thereon. I have some original shaders, but I'd never even been aware of Shader Toy until a couple of days ago... I hadn't given any though to submitting anything, that's for sure! There's some really awesome stuff there. There are some things that are pretty much really, really basic shaders, that have been around for a long time on there, but that well developed demoscene stuff just blows my mind. IQ is amazing (as I said in another post). Checkout his home page, it's worthwhile. He doesn't give many (or any?) complete code samples, but reasons through stuff quite a bit. The things that he's made with shaders are very inspiring. With something like the metablob shader, or this shader, in the examples, there's a blobby center of interest (or multiple)... that's usually being animated with some kind of waves (sin/cos, etc.). By stripping that out and providing access to the raw x/y coords, declaring them as uniforms, you can get access to them as input ports. It's usually the math to add up the extra stuff (the finger blobs in this case), or map x/y to QC screenspace that takes the most time. On the number count - there are two extra multitouch, and one extra tweak I've done of the menger sponge. Other than that, the count may be higher, because I also had some shaders from an old version of shader toy, so they're grouped in that same zip on the other thread. DNA Flow - really sweet - probably from the older version of Shader Toy. Definitely some outstanding work all around on iq's site :-) . Interesting approach - seems kind of like retro fitting from sinoidals to real , rather than computed variables input to faciltate the multitouch, Only just begun to get my head around the requisite alterations and additions you've made . Yeah, that's one of the older ones, for sure. I like that one a lot - it makes cool orbit traps with the texture. I like that it has a plasma/2D feel, but also feels very fractal like. That one can be interesting as a source for particle flows. When you look at the original shader, there's a point of interest that the ripple originates from, and that's also fairly bright. The sin and cos multiplied over time is what's making the movement of that, and the halfres.x and y stuff is what's setting it up so that it moves according to what one would expect over width and height. The float cLength is setting up the variable that allows the ripple to happen over x/y and for the color brightness thing that happens at each point. I'm setting up new variable names that can be accessed from input ports. I'm stripping out that movement and replacing it with exposure for the multitouch to control the x/y coords manually. In order to add new "blobs", I'm adding new coordinates for each one. The 50.0 value is controlling the strength of the blob in relation to the x/y coords. So, by exposing that and calling it "s1" (like "size 1"), the size can be controlled my the size parameter of the multitouch with a little bit of multiplication to sweeten it up. In this case, adding all of the size/cLength's up results in an OK addition of the points, visually speaking. It will require OS X, and installation of the kineme multitouch patch ( I think it's available in Downloads ), to run the "qtz" file. I went ahead and compiled it as a self contained app, so that you don't need to install Developer Tools, etc., if you haven't already, or fuss with plugin install. If you have some of the Lion OS X multitouch commands enabled, like "when there's four fingers down and swiping, make all windows do weird stuff", then they should probably be disabled for smooth use of the app, while one is using it. From Shadertoy to Quartzcomposer: Help! generate depth map from 3d objects? Shaders in a plugin ?